Dr. Egbert is a native of Utah and was excited when the opportunity presented itself for him and his family to return home. Dr. Egbert graduated from Brighton High School and attended the University of Utah earning a degree in Medical Biology. 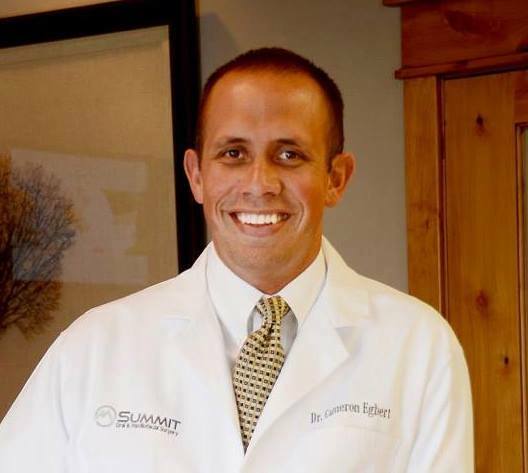 Dr. Egbert then completed his dental training at the University of Utah Medical Center and then Creighton University receiving his Doctor of Dental Surgery degree. He then began is Oral and Maxillofacial Surgery training at Froedtert Hospital and the Medical College of Wisconsin, Children’s Hospital of Wisconsin and the Milwaukee VA Medical Center. There he not only received thorough training in Oral and Maxillofacial Surgery but also, internal medicine, emergency medicine, general anesthesia, trauma surgery, general surgery, neurosurgery, and plastic and reconstructive surgery. Dr. Egberts training had an emphasis on dento-alveolar (teeth) surgery, implant dentistry, orthognathic (corrective jaw) surgery, oral pathology (diseases of the face and mouth), TMJ surgery and facial pain, general anesthesia, surgical correction of obstructive sleep apnea,as will as trauma and reconstructive surgery. Dr. Egbert is also trained in basic life support (BLS), advanced cardiac life support (ACLS), advanced trauma life support (ATLS) and pediatric advanced life support (PALS). Dr. Egbert and his wonderful wife are proud parents of three beautiful girls. In his spare time, he enjoys playing sports, fly fishing, skiing, working out and spending time with his family. Copyright © 2016 Summit Oral Surgery. Designed by A2 Solutions.